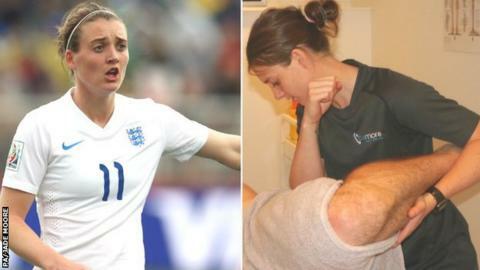 The discovery of two holes in her heart as a teenager taught future England midfielder Jade Moore about how fragile a football career can be. Faced with the very real prospect of a life outside sport, the then 17-year-old had surgery knowing she needed a back-up plan. By the age of 23 she had her own business and, 12 months later, she was a member of England's bronze-medal-winning World Cup team in Canada. It was before an England youth training session at Loughborough University that Moore had the cardiac screening that revealed her heart condition. "It was very touch and go - and I was a millimetre from having to have open heart surgery," said the Birmingham City midfielder, who had her atrial septal defect (ASD) corrected with a device connected via a flexible tube inserted through her upper thigh. "It did happen at a crucial time in my life and did open my eyes to what life would be like without football. "In the end it did not affect how I was as a footballer, it just made me look at life a little differently." And when the midfielder helped England's women to their best-ever World Cup finish, she was also ensuring her business interests back in Birmingham received a huge boost. Moore, a qualified sports therapist, had set up her own company - BeMore Health and Fitness - and within two years had expanded from physiotherapy and sports therapy into personal training and coaching, after enlisting the expertise of Blues team-mates Remi Allen and Jo Potter. With the Lionesses in the summer, Moore and Potter distinguished themselves as "poster girls" for English football - joining a squad of players that the Football Association hopes will inspire future generations. Through the business, they are ensuring they play a leading role in securing that legacy. "There is definitely a niche there - young girls, young boys that want to aspire to be best they can be," Moore told BBC Sport. "The World Cup has grown a whole generation of interest among people that probably haven't even kicked a ball. For me it was an easy thought process to bring in a coaching arm." For 16-year-old Beth Pope, a striker for Solihull Moors Women's Under-18s, a late summer training session with England and Birmingham City defender Potter on a school field left "a lasting impact". She said: "They are like the superheroes of women's football. It is really good to have them around. "It was really beneficial because it really brought up our confidence - even meeting someone like that is special." By beating Germany to clinch bronze in Canada, the Lionesses became the most successful England football team in 50 years and sparked a major change in the public consciousness back at home. The immediate impact saw attendances at Women's Super League games rise to an all-time high. Potter, who claims she was blocked from playing football with boys at the age of eight because parents of opposing teams objected to girls being involved, is proud to be influencing the game after joining Moore's entrepreneurial pursuit. "As we move forward we want to keep that legacy. It's not just a spin-off from the World Cup," said Potter, who has worked as an FA skills coach and aspires to move into management one day. "Since we have come back from Canada it has really kicked off and it is brilliant seeing the types of people that want to get involved. "We coach all levels from elite to grassroots. It's not not just girls I coach, not just boys I coach or five-year-olds or 17-year-olds. It's nice that we are having an impact on different age ranges and different sexes." In her business, Moore has surrounded herself with Birmingham City colleagues. She founded it in partnership with Blues physiotherapist Tim Colledge, expanded into personal training and employed team-mate and long-time friend Allen before bringing Potter on board as a coach. In between playing and training commitments, Moore continues to work as a sport therapist and organises training and coaching sessions, which Allen and Potter oversee. "Jo and Remi are two really good friends of mine," Moore said. "Trust and reliability are massive in business. If you can trust them and rely on them, then you don't have many qualms when going into business together. If they didn't have those attributes, they wouldn't be here." Allen admits having Moore as a boss can be "unusual", but quickly added: "I don't think I could wish for anything better than this. "She is my best mate. I can talk to her about anything and then she provides me with work as well. "She has done really well; she has got brains about her. She has started building things now, her football career is on the up and things are looking good for her." Birmingham City managed to avoid relegation from WSL1 and are set to face Arsenal in the Continental Cup semi-finals on Sunday, although Moore's season was ended early by an ankle injury. But with a burgeoning business and football career to juggle, every day throws up "exciting" prospects. "It all depends on what day of the week it is - on Monday I start my day as a business owner and Tuesday I start as a footballer," she said. "Sunday, I definitely wake up and end the day as a footballer. "It keeps me on my toes and keeps me level headed with the football side of it." But it is all from Damson Park, home of Birmingham City Ladies, that she has realised her career and life ambitions - even those she once thought unattainable. "I always wanted to be a footballer, but I was always quite realistic and there wasn't a career path to be a professional women's footballer back then," Moore said. "Now I'm 24, have been to university and walked away with a sports therapy degree and I'm more than happy on the path that I'm on. I'm pleased where I am football-wise and business-wise. "For me as a footballer it has been a great year, playing in a World Cup in Canada, doing well and coming back with a bronze medal. And for me as a business owner, expanding the brand and getting it out there has been fantastic."